Developments in the Mile-Ex are really making a buzz! Until a few years ago, it was almost impossible for developers to build in the area because of the lack of space. Today, the area is bustling with numerous new cafés, restaurants and bars. In other words, this Montreal hidden gem is a neighbourhood being rediscovered, redeveloped and reinvented. Mondev, the Montreal developer behind the Mile X, now in its second phase, knows that this unique neighbourhood is doing a great job of attracting all kinds of people. Built from the ground up, Mile X offers a total of 45 units ranging from 550 to 1,000 square feet, with indoor parking. 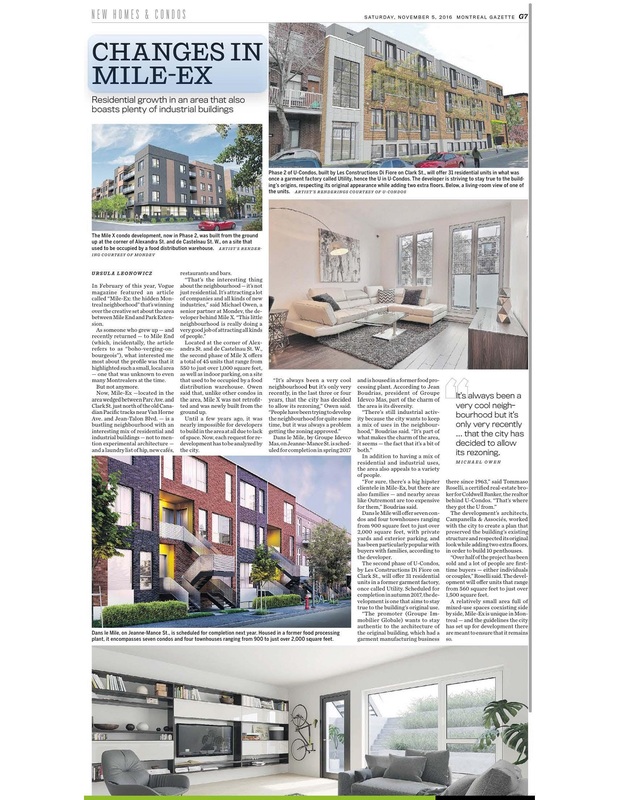 This very cool city borough, which combines the charm of industrial and residential, is an affordable alternative to the expensive neighbouring area of Outremont for families, and an attractive option for first-time buyers. With over half the projects sold, many will be looking forward to calling the Mile-X home as early spring 2017. This article originally appeared in the Montreal Gazette on November 5th, 2016. Find out more about the Mile X here.